If you live in Rochdale and are looking for local TV or satellite installation and repair experts, then call The Aerial Guys. We are passionate about providing you with the best possible service. Contact us today on 01706 538045 to book an appointment. Our extensive network of engineers work throughout the North of England. So, at The Aerial Guys we will always do our best to make sure an expert engineer is available to visit your Rochdale home, often on the same day you call us. We have carried out countless TV aerial installations in Rochdale over the years. So, unlike the larger, more anonymous companies, The Aerial Guys really do make it possible to give you a local service that you know and trust. Call us today on 01706 538045. Our friendly and professional engineers will carry out an initial assessment of your TV aerial requirements before presenting a fixed price quote in advance of any work taking place. So, whether your TV aerial’s in need of repair, or you’re planning on installing a new aerial installation, The Aerial Guys are always on standby, to make sure you get that all-important picture quality. 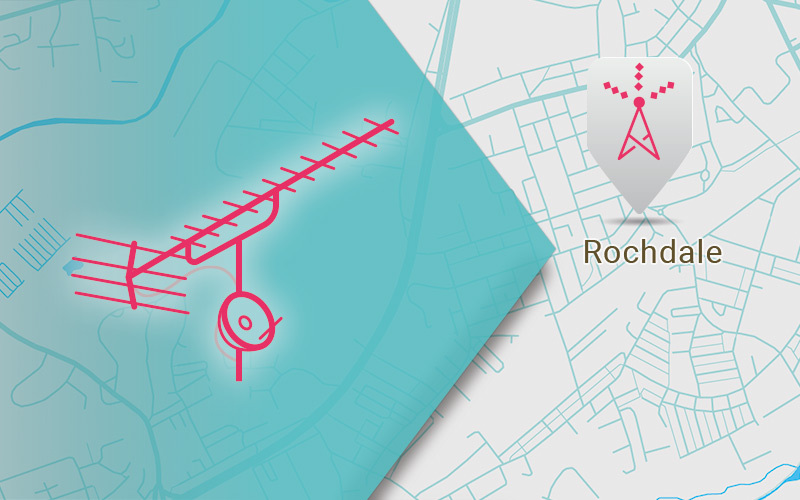 Why not speak to one of our technical advisers today on 01706 538045 to find out how to arrange a visit from your local Rochdale aerials engineer. If your satellite signal is driving you insane, or your TV has a substandard picture, then The Aerial Guys are experts in satellite installations and repairs. If you need an entire satellite installation in Rochdale then our engineers can sort out the complete package – from fitting your satellite dish, to configuring your set-top box and sorting out all the associated cabling. At The Aerial Guys, we can carry out full satellite repairs in Rochdale and the surrounding area. We are specialists in installing and repairing all the main satellite services, including Sky, Freesat and European satellite installations. Our professional engineers permanently carry a diverse range of equipment suitable for all the main satellite types, which means that we can usually fix most issues when we visit. So, if you live in the Rochdale area, and need a local satellite repair service, speak to The Aerial Guys today on 01706 538045. “At first, I blamed my son for the poor picture on the TV,” says Mandy. “He’s always messing about with the settings on the controller. But after a while I could see that it was more than that. There’s only the two of us at home so there’s no one else to ask really. My neighbour tried to fix it but I think he just made the picture worse. It was rubbish not being able to watch my favourite soaps. I was getting really behind with the stories. “Then I found out about The Aerial Guys. They came around straight away and I don’t what they did but the engineer got the picture back up and running within the hour. I thought it would be really expensive but it wasn’t at all. And there’s a helpline number to call if anything goes wrong again. I can catch up with Corry now! Brilliant!” she says.